Buying headphones is an incredibly personal decision, but there are still a few models that are so popular, you have to try them out. Today, we're comparing three of the world's most popular cans. 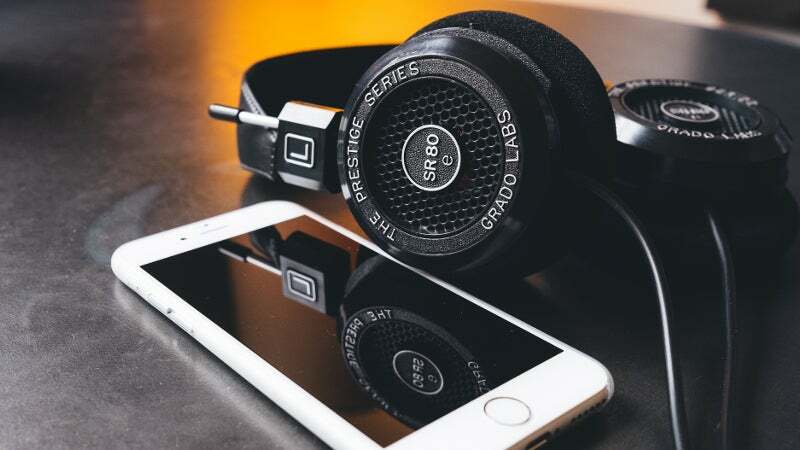 The Grado SR80e ($238.99): winner of our headphone hive five, this is the #1 favourite headphone of you, our loyal readers. It occupies the middle of Grado's reasonably priced Prestige Series. The Audio-Technica ATH-M50x ($189): Arguably the most popular and oft-recommended budget headphone around, the M50x is a closed-backed headphone with a fun, "v-shaped" sound signature that cranks up the bass and treble. Perfect headphones for those graduating from Beats by Dre. The Sony MDR-V6 ($199) and it's nearly identical sibling, the MDR-7506: These headphones are incredibly popular with professional audio producers, and with good reason: they're inexpensive, comfortable, closed-backed, and have a more "flat" sound signature, so you hear the music closer to how the artist and producer intended. While these price points may seem a little less than equal, comparing these headphones is like comparing apples and oranges. Just because the M50x is more expensive than the V6 doesn't mean it's better (quite the opposite, if you ask some people). We debated comparing the more similarly-priced ATH-M40x, but the sheer popularity of the M50x made it impossible to leave out. Besides, the M50x goes on sale so often that you can easily get it for less than its normal price tag. Each of these headphones are incredibly popular for their own individual reasons. Let's talk about why. The design of a headphone isn't just about looks. It's about build quality, ease of use, portability, and...well, ok, it's a little about looks, too. The Grado SR80e has a distinct retro look and feel. The old-school pads sit on your ears, not over them, and the back has an open grille that allows for passage of sound. The headband is a simple leather band, and the adjuster is just a metal bar connected to each cup. They're more durable than they look, but they probably wouldn't put up with as much abuse as some other cans (like the M50x). Some people love the way the SR80e looks, some people hate it, but you can certainly step it up a notch if you're willing to mod them with wooden or aluminium cups. The Audio-Technica ATH-M50x (pictured above) is one of the most well-built headphones I've used at this price point. The cups swivel for perfect ear position, the joints are smooth and don't creak, and you can fold the headphone into a nice portable package for travel (it even comes with a little bag). The cable is detachable, and comes with a short cable, a long cable, and a coiled cable. The ear pads, while pleather, are nice and cushy. The adjustable bars click very smoothly between settings for larger heads. The Sony MDR-V6 and MDR-7506 occupy a nice space between the other two headphones. They're light like the Grados, but feel a bit sturdier. They also fold up for travel, and are a bit more compact than the M50x (and also come with a pleather bag). There are some small wires going from the headband to the cups, which is a little annoying, and the ear pads tend to start flaking little pieces of leather after a while, which means you'll definitely want some replacement pads. They come with a coiled cable, which I appreciate, but it isn't detachable. So if you prefer straight cables, you're out of luck. The most important part of picking a headphone, obviously, is how it sounds. But quality is not a simple "1 through 10" rating — every headphone has its own unique sound, and each excels at different types of music. The SR80e (pictured above) puts the midrange front and center, which means guitars and vocals sound very present. It gives rock and metal an awesome in-your-face feel, whether you're listening to the buttery guitars of the Allman Brothers or the face-melting crunch of Humanity's Last Breath. It also sounds pretty good on the more acoustic-y side of pop as well. The SR80e lacks a little in the deep bass department, so electronic and rap — while they still sound decent — won't get you grooving quite as much as a bass-heavy headphone. This isn't really a problem with rock and metal, since that guitar crunch will get you rocking out pretty hard. The real winning feature of the Grado, however, is the fact that it's open-backed. Open headphones allow sound to pass through the cups, which gives your music a much more natural and — for lack of a better term — "open" feeling. This alone makes them my favourite of the bunch. It does, however, mean you can still hear the outside world, and the outside world can still hear your music — so these aren't headphones you'd want to wear on a plane or in the library. That may automatically disqualify them from your search, depending on what you're looking for. 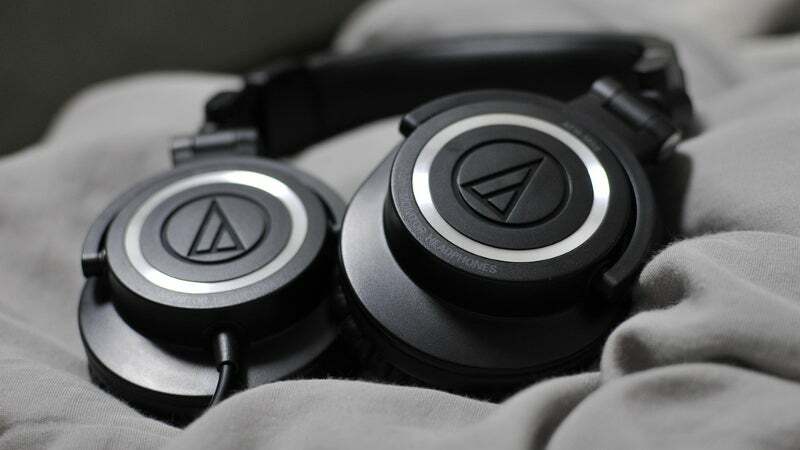 The ATH-M50x, on the other hand, is a closed headphone. That means the lower end of the spectrum is going to sound a bit muddier, but you are much more isolated from the outside world, which is great for travel and work. The highs are still remarkably clear on the M50x, and the bass packs an awesome punch. They have a bit of a dip in the midrange — so they aren't really ideal for rock and metal — but pop, hip-hop, and electronic sound absolutely banging on these headphones. If those are your genres, these are the cans for you. Approaching Nirvana never sounded so good. The MDR-V6 and MDR-7506 are also closed headphones, but they occupy a nice space in between the SR80e and M50x in terms of sound. They don't have the natural, airy feel of an open headphone, but they sound less muddy than most closed cans. They also aren't lacking in any frequencies like the SR80e and the M50x, either. They aren't perfectly "flat", but the bass, midrange, and treble are all there in more even proportions than the other two headphones. The bass is present, but not bangin', the mids are a touch forward, but not too harsh, and the highs are clear and pleasant. 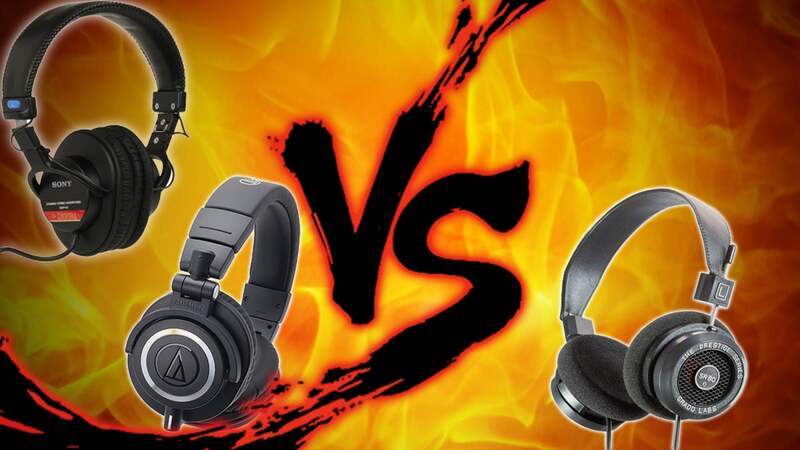 As a result, the Sony doesn't excel at any one genre, like the Grado and Audio-Technia. However, no genre will sound lacking, either. It will sound pretty great no matter what you throw at it — rock, electronic, classical, or otherwise. 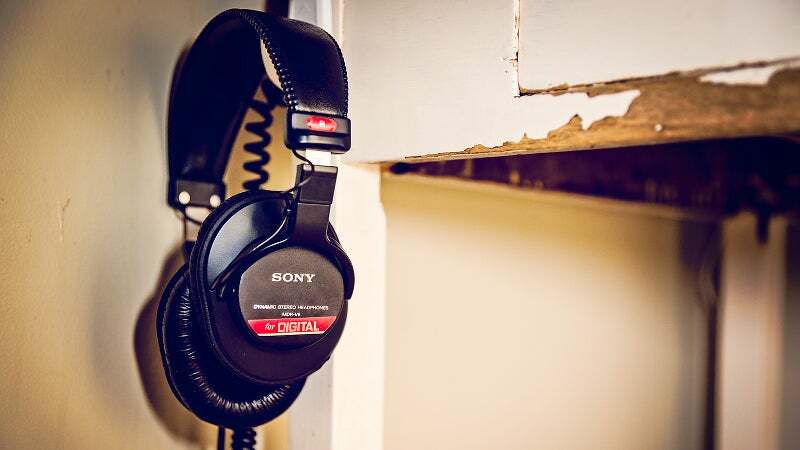 If you listen to a lot of different genres, the Sony is a great all-arounder. You're going to wear these headphones for more than a few minutes at a time, so comfort is important. More important than you probably think. Comfort can be the difference between love and want-to-chuck-it-out-the-window, so don't neglect it when picking your next set of headphones. The SR80e feels a little weird when you first put it on. You have to adjust it a bit to find the right fit, and even then, the foam feels kind of harsh and itchy. You might be tempted to write it off immediately, but give it a chance. Once you get past the first few minutes of wear, the SR80e is actually very comfortable. It's light on your head, and breathes a bit better than over-ear headphones so your ears don't get too hot. After a while, I forgot it was even on my head. The ATH-M50x is kind of the opposite. When you first put it on, it feels nice and plush, but becomes uncomfortable after a few hours of wear. It has a pretty strong clamping force, which is good for sound isolation — and that heavy bass — but after a while it feels a little like your head's in a vice. The pleather ear pads envelop your ears so snugly that they can get a little hot, too. Worst of all, though, is the bar across the top, which puts a lot of direct pressure in a small space on your head and starts to hurt after a while. You can alleviate some of these problems to a certain degree, but the M50x will probably never be quite as comfortable as the SR80e or the V6. The MDR-V6 (pictured above) and MDR-7506, once again, fall in between the other two cans. They are over-ear headphones like the M50x, so your ears can get a little hot over time, and they do clamp a little bit. But the headband is a bit wider, which means you don't have quite as much direct pressure on top of your head. For closed headphones, the Sonys are decently comfortable. All three of these are pretty great headphones, especially for this price range. You really can't go wrong with any of them, but the best headphone will depend on what you listen to and where you listen to it. If you listen to pop, hip hop, or electronic music, the ATH-M50x will blow you away, though they might get a little uncomfortable. For other genres, the M50x is the worst of the three. If you listen to rock or metal at home, where no one will mind sound leakage, you'll love the open sound of the SR80e. If you listen to rock out in the world, though, and need a closed headphone, the V6 will be a better choice. You get the idea. Of course, these aren't the only three headphones in the world, either — just three of the most popular. If you want an all-around headphone like the V6, but prefer open-backed, try the AKG K240 MK II. If you like the sound of the SR80e but have a bit more cash to spend, upgrade to the Grado SR125e, or the SR225e. Remember, your holy grail of headphones will be different from everyone else's — it's all about your budget and needs. Photos by Ryu1chi Miwa, Jonathan Grado, and Charli Lopez.